The river and springs, including Ichetucknee Springs State Park, are valuable cultural and ecological treasures that must be protected. The Ichetucknee River and springs have played a central role in the lives of people in surrounding communities for thousands of years, from the time of the Paleo-Indians until today. The river and springs also support a rich diversity of animal and plant life. Coffee Spring on the Ichetucknee is the only home of the Ichetucknee Siltsnail (Floridobia mica), a Vulnerable species. In 1970, the State of Florida recognized the archaeological, historical, cultural and ecological importance of the Ichetucknee River System by purchasing 2335 acres for $1.85 million to create Ichetucknee Springs State Park. Since then, the State has spent an additional $36.1 million to acquire other properties throughout the Ichetucknee Trace that protect the Ichetucknee’s water sources. These purchases included active mines that were acquired to protect caves and underground water conduits from blasting and excavation. All together, the State of Florida has invested almost $38 million for purchase and protection of the Ichetucknee River System. In 1971, the Federal government recognized the significance of the Ichetucknee by designating the park’s headspring a National Natural Landmark. In 1984, the Ichetucknee River received Outstanding Florida Water designation from the State of Florida. The Florida Fish and Wildlife Conservation Commission (FWC) has recognized the Ichetucknee as a significant site on the Great Florida Birding Trail and the National Audubon Society has identified the area as an Important Birding Area (IBA) of Global Significance. The river and springs provide jobs for local residents, economic benefits for our area, and recreational opportunities for tourists and residents alike. Florida has the largest concentration of freshwater springs on the planet and these natural wonders, including the Ichetucknee, attract visitors from all over the world. The economic impacts of tourism and ecotourism are vitally important for surrounding communities. Ichetucknee Springs State Park provides jobs for nearby residents, economic benefits for local businesses and surrounding communities, and recreational opportunities for close to 200,000 visitors each year. A traditional economic impact study conducted in 2003 found that the total estimated spending by visitors to Ichetucknee Springs State Park was approximately $23 million per year, or $34 per visitor; that spending accounted for over $5 million in wages and salaries and supported 311 local jobs. Additionally, over 2500 taxpayers own property in Three Rivers Estates and Ichetucknee River Estates on the lower part of the river that lies outside the state park. Pipeline construction carries the potential for irreversible damage to the river and the springs. The source of the Ichetucknee River and its associated springs is underground water that flows through cavities in porous limestone that has been described as looking like Swiss cheese. Any change to this network of underground water conduits in the area surrounding the Ichetucknee River has the potential to siphon water away from the river and springs. One wrong move during pipeline construction could cause us to lose the Ichetucknee forever. Pipeline operation, either now or 50 years from now, creates a safety hazard and carries the potential for irreversible damage to the river, springs, and wells of area property owners. Pipeline failures can cause explosions that result in human casualties and the loss of property and businesses. Through September 28, 2012, Florida had experienced 56 significant pipeline accidents that resulted in six fatalities, 23 injuries, and $40.6 million in damage. One bad accident could change the network of water conduits underneath the Ichetucknee and siphon water away from the river and springs, causing us to lose the Ichetucknee forever. Given the cultural, ecological and economic significance of the Ichetucknee River System and Ichetucknee Springs State Park, as well as the State of Florida’s investments to preserve and protect this area, we believe that the risks of the proposed pipeline route greatly outweigh any possible benefits. While we recognize the need for pipelines, we believe that the restoration, preservation and protection of the Ichetucknee River System—a natural treasure that has existed for thousands of years and is part of the cultural and economic lifeblood of North Florida—is more important. So we turn to the Precautionary Principle for guidance: When an activity raises the threat of harm to people or the environment, we are justified in taking precautions against such harm even in the face of conflicting or incomplete science. 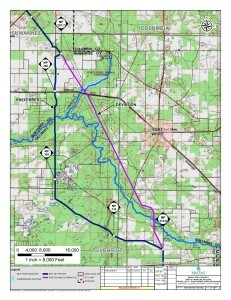 To ensure the preservation and protection of the Ichetucknee River and its associated springs, the Ichetucknee Alliance strongly urges Sabal Trail Transmission to find a pipeline route that bypasses the full 5.5-mile length of the Ichetucknee River and avoids the surrounding areas that encompass the Ichetucknee Trace and Ichetucknee Springshed. See also the Ichetucknee Alliance position paper from August 2013. And see also Ichetucknee River Estates Landowners Association against the Sabal Trail pipeline.